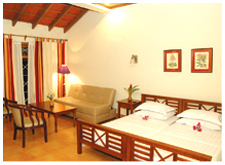 Access : 10 Kms from Mangalore Centre & Railway Station / Bus Stand, 6 Kms from the Kerala Border, 2 Kms from Ullal Railway Station. Check In / Out Time : 12.00 Noon/ 11:00 A.M. The above tariff rates are inclusive of all taxes. Tiled roof villas, Chinese, Manglorean and Multi Cuisine Restaurant, Swimming Pool, Conference facilities, Board Rooms, Club facility with Billiards, Snooker table, Mini Library, Table tennis, Indoor Badminton (In a Multipurpose hall), Jogging Track, Children’s park & a Variety of Indoor games, Meditation & Ayurvedic Health Care. 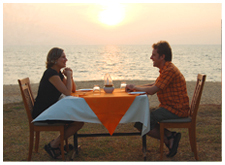 Boating Sea/River Cruise, Fishing, Back Waters, Bird Watching, Trekking, Beach Treks, Culture trips, Sight seeing, Shopping, Ideal honeymoon Getaway. Picnic Venue, Car / auto rental, Travel arrangements, Guide Service, Doctor-on-Call, Money Changer, Safe Deposit Lockers. An ideal retreat for Painters, Writers, Photographers & Artists in general. Venue for large lawned reception upto 3000 persons with ample car parking. Prayer room and facilities for Christian prayer seminars & retreats. All in a 15 acres Palm Grove Paradise by the sea.